The Hudson’s Bay and Clinique.ca offer Clinique gifts regularly at 2 times a year in Canada. 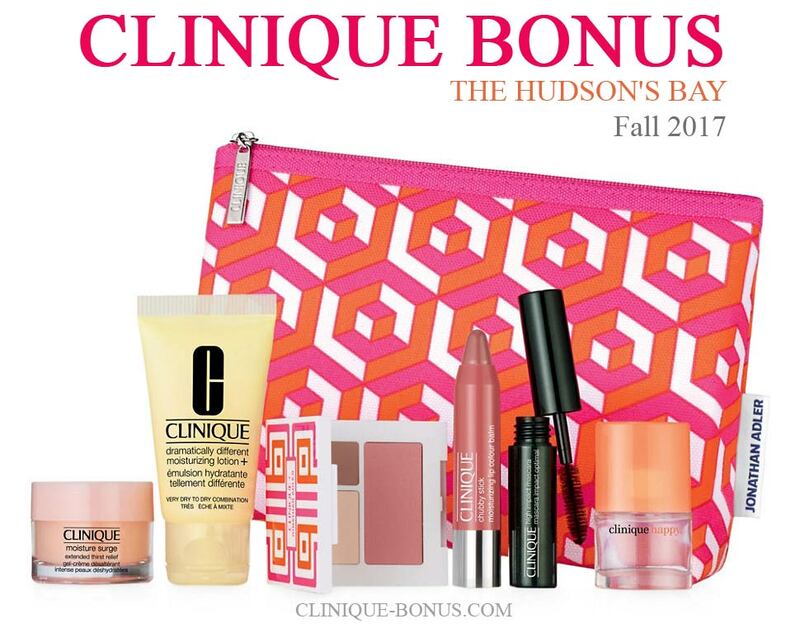 Bonus time at The Bay usually starts in March and September and at Clinique.ca in April and October. Update about Sears & Holt Renfrew: these merchants will no longer offer a bonus time in Canada. Get a free 7-piece gift direct from Clinique.ca website. Yours with any $29 purchase. If you wish to view and compare previous gifts offered in Canada, click on the button to show those offers. We list offers which were available during the past 2 years. Clinique gift at The Hudson’s Bay from March 13 to March 31, 2019 or while supplies last. Online and in stores. Note that in store offer may vary. A free 7-piece gift (a $100 value) with any C$39 Clinique purchase. Spend C$75 and choose an extra gift: Dramatically Different Lipstick Shaping Lip Colour in Canoodle with Mini Cosmetics Pouch OR Clinique Smart Night Custom-repair Moisturizer. A combined value of $150. Enter promo code SPRING at checkout and get $10 off your $75+ beauty purchase. Promo code expires on March 28, 2019. You can choose your gift at checkout. Free shipping on any beauty order during the Beauty Week (Mar 22 – 28, 2019). The offer ends on March 31, 2019 or while supplies last. Online exclusive gift with purchase on the Clinique.ca website. A 7-piece Clinique gift – yours free with any purchase of C$39 or more. If you spend more (C$65+) you can enter coupon code MORETREATS and add a free trio (Moisture Surge™ 72-Hour Auto-Replenishing Hydrator, Moisture Surge™ Overnight Mask, Limited Edition Eye Mask in Plush Pink). Spend even more (C$85+) and enter promo code ALLTREATS to add also a free tote bag. $170 total value. Offer is subject to availability. Note: The same gifts are also available on the Clinique.com website. There is a bonus time at The Hudson’s Bay – from September 11 – October 5 2018. Choose your free 7-piece gift with any C$39 Clinique purchase. There are 2 variants of the gift: Easy looks for standout eyes OR Perfect Pairings: Lips and Cheeks. Spend C$100 or more and take it all home in a Kapitza tote. A total value of $170. Shipping is free with any $29+ beauty orders. No promo code needed. The gift should be added automatically prior to check out, if not, it is out of stock. Update May 9th: The offer below is no longer available. Clinique bonus in Canada is available direct from Clinique.ca website. From April 20 to May 6, 2018 or while supplies last. All gifts up to a $172 value. The first regular Clinique bonus promotion in Canada in 2018 is at The Hudson’s Bay. Starting from Tuesday – March 13, 2018 (Wednesday, March 14 instore) to April 3, 2018. A skincare and makeup set featuring Clinique favourites. Imported. All nine pieces worth over $140. The gift(s) will be added automatically at checkout. Shipping is $5.95, free when you spend $49 or more on beauty (any brand). There is a free 7-pc Clinique gift on the official Clinique.ca website – free when you make any purchase of $35 or more. A $95 value. You can choose your lip shade, moreover when you spend $65 or more – add a free full size Clinique Smart Night™ Custom-Repair Moisturizer (enter coupon code SMARTNIGHT) or All About Shadow™ 6-Pan Palette (enter coupon code EYEPALETTE). Can’t decide? Spend $85+ and get both of them with promo code 2TOGO. While supplies last. Note the same offer is now available also on the Clinique.com website. 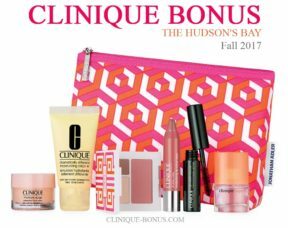 The Fall Clinique bonus (GWP) at The Hudson’s Bay starts on September 12, 2017. Yours free if you spend $35 or more. There is also an additional gift if you spend $75 (another mini bag and two lip sticks or a moisturizer) – really great deal as always from The Bay. Shipping from The Bay is free for beauty orders over $49, otherwise $5.95. My question is to why Clinique does not offer Gift with Purchase at Shoppers Drug Mart Locations? I work at a Shoppers that sells Clinique and I am asked at least once day if we offer the gift with purchases that Clinique.ca and Hudson Bay offer. I often lose a sale when we don’t have these to offer. I have reached out to my representative and wasn’t given any info, I also sent an email to Clinique Customer Service and was told they would forward it to the correct department. I still have not received a reply and this was well over a month ago. I am rather disappointed in the company with their failure to give me an answer. As a manager it would be nice to inform my customers as to why Clinique doesn’t offer this special with us. Why isn’t the bonus available at any store that sells Clinique? I just bought a lot at Shoppers Drug Mart and there was no bonus! Spend$ 39.00 to receive the GWP. Is this before taxes? 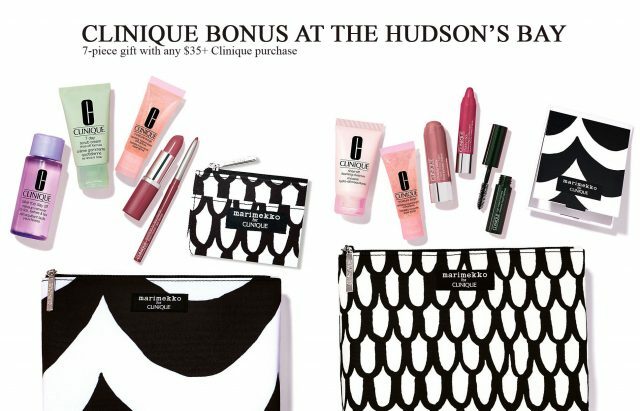 If I order Clinque products online will I also receive the bonus gift offer ? yes, the spring Clinique gift (Mar 13 – 31) will be available online on The Bay website. Have all bonus times been discontinued in Montreal, Canada in 2019? In stores on online. When is this promotion available at Shoppers? Clinique bonus time at eglinton square is it still there if so when? Very disappointing. I ordered the bonus deal April 3. Was told no bonus kits available so I don’t get one even though it was still bonus time. Will be sending my purchase back if I don’t get a bonus. I am contacting to say how disappointed i am with clinique and the bay.I purchased 300$ WORTH OF THE PRODUCT only to be told they don’t have the bonus stated on the promotion. I feel this was an epic scam as my purchases were at the beginning of the promotion.In the future I will look else where for the product perhaps maceys treats their customers better then clinique and the Bay.I not only did not recieve the three bonus tote bags but they never even had the eye shadow mascara part of the extended bonus….major drawing card SCAM!! !Shame on you clinique and The Bay….I am sure SEars and even Eatons would not have treated their customers this way!! Really sorry to hear that. Next time you could try ordering online where you can see the bonus gifts in your shopping bag. If not, they are out of stock. I was at the Hamilton Limeridge mall store a few days ago to take advantage of the bonus. Sadly items that I went for they did not have in stock. (3) instant pore minimized, airbrush illuminater and chubby cheek shade I use. I ended up buying things that I actually didn’t need or can use and to top it all off even though I went much higher than the 100.00 dollar cap to receive a bag, they did not have that either! Boo on you Clinique. On September 30, 2017, (the last day for the bonus) I call the Yorkdale Clinique counter and requested if they had the eyeliner pencil in charcoal grey. This was my favourite and I shopped other stores and no-one had it in stock. Yorkdale told me they were out of stock but would order it for me. They took a credit card number (to reserve the bonus for me) and said they would call me when they were in (I was ordering two). About 10 days later, I had not received a call back so I went in personally. They could not find my order but said someone would call me after they tried to get these pencils for me. About 10 days later, no call back so I went in again personally. Again, no answer for me. The manager for cosmetics counter s happened to be there so I explained the whole situation to her. She was concerned that no-one had called me back and she would personally look after me. It was a Friday so she would look into it on Monday and call me back. I told her that if charcoal grey was not available, I would take intense grey (which they also did not have there at the time). TO DATE, NOONE HAS CALLED ME BACK and the bonus which was being held for me is probably still sitting there with my name on it. Needless to say, I gave up, and will be looking elsewhere for my eyeliner, as I have also lost the bonus! I’ve used your products for 27 years and it’s time to move on. I’m so sick of never knowing when your Clinque Days are in Canada! Spring 2007 didn’t start on time and now fall 2017, Clinique Days are OVER at The Bay. No ads, no notification. I also suspect that your product will not be sent to Sears in October/November, since they’re going bankrupt. Is this correct? Or once again, will your company neglect to notify long-time users of pertinent information??? I live in New Brunswick where all Sears stores will be closing soon. I usually stock up on Clinique at Bonus time. I see the Bay bonus has finished. Will it be available elsewhere this Fall? Looking for bonus time date for the Jean Coutou in Saint John NB please. Sears is no longer open here so my only option in the Jean Coutou store. Thank-you, Alice, for the tip about the April 22, 2017 bonus at clinique.ca. I just got this GWP plus step-up gifts after spending $85+. It is super! This is my first time ordering from clinique.ca. I did not realise it had GWP similar to Sears/Hudson’s Bay. Please let us know of any other great offers from clinique.ca. Is it possible to request for a small sizes Clinique perfume?It’s always good to have it in the bag.Thanks! Hi! I’m just wondering if you have a pic per chance of the CLINIQUE gift (w/purchase) @ SEARS beginning on the 26th of April. I live a 1/2 hr. drive from the Belleville, Ontario, Canada SEARS location and like to see what’s offered before “pre-ordering”. Thank you for all your work and the awesome website! In response to Miri: when I don’t see any details online or in the newspaper/flyers about the contents of the bonus at Sears/Hudson’s Bay, I phone the store and ask exactly what items are in the bonus. Darn I missed bonus time at the Bay, please let me know when bonus starts at Sears. This site says end of April but does not give specific dates. I’ve been loyal to clinique too long to remember when I bought anything else (tried Mac 5or 6 yrs ago but did not like as much as cliniqye) Love bonus time and hate when I miss it. Thanks for your help and thanks for bonus times. I bought enough merchandise to qualify for the Bay’s spring bonus. Got an email saying the items (plus some tiny samples from other lines) would be shipped in two batches. The qualifying item and two of the small samples were shipped right away. Two days later I got another email saying the Clinique bonus had been cancelled, no reason given; the remaining 2-ml perfume sample was shipped all by itself! Wouldn’t have ordered without the bonus, so now I have to return the items I received. And the website is still showing a bonus is available. The items in it are different from the one I ordered, but I’d rather have had it than nothing. Or else an offer to cancel the order if the bonus had run out. Not impressed, as I set out to the dollar store to buy packing tape to box up and return the items. If you order at the Bay online you can return it to any Bay store. Sears is the same. I went to the Clinique counter at The Bay yesterday to make a purchase and receive my bonus gift which your advertising claimed to be valued at $95. Talk about misleading advertising. The bonus gift “might” be worth $25 tops. A cosmetics bag that I could purchase at any dollar store plus half a dozen very small sample products. There is no way this is worth even close to $95! All the offers are while supplies last. Sometimes the products can be replaced with different similar products, but all the details above were correct on the date of publishing this offer. Can you please tell us what product is included in the Clinique bonus starting March 15 2017 at the Bay. To be honest, I have no idea. I recommend you contact your local store directly for the most accurate information. I have two charges from my debit which I am VERY UPSET about. I was very clear over the phone that I was paying for shipping and handling only and my order was to be canceled. I did receive a microscopic size sample which exceeded the shipping and handling costs. We would like these TWO amounts credited back to our account immediately. Thank You. Please provide a phone number so I can contact you! Thx. $114.32 for love eye serum and $121.04 for face serum. I am not happy with these products nor how my phone call to cancel was ignored. I have recently bought products online for more than $ 50 (order No. 2665691063), but I did not receive the 7-piece bonus. Would it be possible to send it to me? When is you next Bonus time in Canada this year? I am unable to find Clinique “Naturally gentle eye makeup remover” in Calgary. Is this product still available or has it been discontinued? I prefer a creamy makeup remover over the liquid ones. Was in to Sears yesterday, Bonus has started. Do any Holt Renfrew stores in the GTA still carry Clinique product line? Holt renfrew at square one (formerly sherway gardens), no longer carries any Clinique. So sad because the Clinique bonuses at Holt’s were much better than the rest. Curious whether Nordstrom and Saks in GTA will have Clinique bonuses…anyone know? I do not see the date for the October 2016 bonus time at Sears Canada. I live in a small town with a Sears as the only Clinique retail store for bonus time which I look forward to every April and October. Could you please advise. It would be very helpful if U would post upcoming sales, galas and/or GWP at these stores. I made a purchase and received the Fall 2016 gift at Hudson’s Bay. Although the gift was advertised in the newspaper with the make-up palette containing “All About Shadow + Blush compact in Blush/Mink/Smoldering Plum”, as described above, what I received for the 2 eyeshadows was morning java and pink chocolate (according to the back of the case) and these were the colours shown as testers at the counter. The blush was smoldering plum as advertised. GWP @ “The Bay” (Can.) starts Sept. 13th (my bday, lol, yay!). I don’t know anymore. I had been using the even better clinical dark spot remover for over 6 months and did not noticed any of my dark spots lightening and the product started to turn a dark yellow so I stopped using it. Not happy with this product. Now that Nordstrom and Saks have opened in Canada, do you think they will be offering Clinique bonuses? If so, will you feature them on this website? Definitely I will post about their bonuses if they start to offer them. I also had a bad experience the last two times at The Bay. I needed to buy Perfectly real makeup Shade numbeer 04, which is normally readily available. No such luck. They didn’t even offer to order it for me in order to qualify for the free product. I ended up not buying anything. Will go back to Sears! I made 2 attempts to make a purchase at The Bay, St. Laurent Mall in Ottawa – was looking for the latest gift with purchase. Service is so bad at Clinque counter on Saturday evenings that I will not go back there. Last evening, February 20/16, when I did track down a person in the general area I was told that the Clinque employee left at 7:30, I commented that I thought the store was open until 9:00 pm, her response was, “well she started at 9 this morning, how would you like to work 9 to 9?” Needless to say, I was not a happy customer. I will contribute this lack of service to management and hoping if Clinque is advertising and promoting a business in which hours are 9:00 am to 9:00 pm that there will be a representative there to serve after I have driven 20 miles. I just shipped at Hillcrest Hudson’s Clinique and was given a bonus that contains 5 pieces with a different lipstick and without the eyeshadow palette. I believe that this is wrong and false advertising of the promotion. There is no Clinique smart custom repair moisturizer. Lipstick is not the Clinique Pop but regular long last only. This is very upsetting. Sorry to hear you have had a bad shopping experience. All the information about the last promotion (7-pc gift with Bold or Pop choice) at The Bay were taken from official thebay.com website. You may want to contact their customer service to explain you why you have received only 5 pieces. when is theBonus event at Shoppers Drug mart? Hi Manjit! Orders typically get sent out a couple days after the Bonus starts. Please send me an email with any questions you might have, I’m happy to help! thanks for ur help. Is this work in mississauga stores also?? You should be able to preorder from your local HBC store however the preorder gift may vary from store to store. Some stores don’t do a preorder gift altogether. To get your products now without Sears, and Holt Renfrew so few. After being a customer for fourty some years, I have to look harder and go further for products. I purchased 60.00 dollarsbworth of your product in order to qualify for the free gift and was told that I would have to leave the product I purchased at the store until after some event in order to receive the gift offer.I think your restrictions and rules very shoddy. I ordered (on line) enough product ($52) to qualify for the promotion but it was not included in my delivered package. I was told that Holt Renfrew no longer is doing gift with purchase in Canada. The Clinique Fall GWP in Sears stores ends Nov 3 I think. You can choose the lipgloss colour too! I think its Clearly Pink and Juicy Apple. Is the clinique bonus offer applicable to purchases online sears.ca? I do not see it up to the point that I a, about to complete my purchase. When does the bonus deal that starts Oct 15 end? I live in Chatham, Ontario .I am very upset that those living in Chatham-Kent no longer have access to Clinique Produces ,they recently closed our Clinique counter at our Sears because we are an outlet store only. We now have to travel 1hour East ,West or North to get to a counter and even hope that we that we would receive the service we received at home from our own representative Michele. Many people in this area of 142,000 unless able to travel are missing out on your product we have used for years and you as a company will be losing a fair amount of revenue. We are very unsure if many will be able to continue to use your product due to availability. I know we can order on line but when it comes to make-up , I for one want to see ,also in this area many may not have that ability as well as traveling to a Counter out of town. Have you tried a Shoppers Drug Mart Beauty Boutique in your area? Some of them stock Clinique products. Your Clinique Bonus used to have a choice of lipstick colours but for the last while that has not been an option. Twice now I have received lipstick that is a colour I cannot use Please give consideration to bringing the option with two colour choices back. The Bay does offer free shipping online on beauty purchases of $29 or more. You should mention that it’s free shipping of $29 or more ONLY IF you PAY with the BAY CREDIT CARD. Otherwise it’s not free shipping unless you spend $99 or more with other payment methods. What is adress nickname and why does it not accept my address. I have lived here for over 50 years. You have to contact the store you have made the purchase with. Is there one coming up at either Hudson Bay or Sears or Holt Renfrew??? actually, I have missed to post info about bonus at The Bay in June/July (excuse me for this), and according to the previous year the next ones should be in Sep and Oct. The Summer bonus offer started at Bay on June 24th, I am surprised there is no mention of it here. I got my purchase and gifts today from Clinique.ca …all of my favourite samples in this one plus beautiful eye shadow and lipstick shades. 1. Is the bag in the picture nylon, plastic or material? I really wish they’d go back to the vinyl bags, they’re much easier to wipe down and keep clean. 2. I called and Holt Renfrew said their bonus starts May 28, 2015? 3. The Yorkdale Mall location for Holt Renfrew – there is no staff for the Clinique counter? Wow, that’s lots better than the lame one at Nordstrom. More of a question. I just recently bought an Aromatics Elixir 6.7 ounces. I notice now that some stores are giving out a free bonous pkg. Had I know I would have waited and gone to Sear. Do you forward pkgs of the bonus to purchasers? Hi, I pre ordered my item and my bonus months ago, and the lady said that it should be shipped to me as soon as the contents started, which I believed is April 23th, its April 27th I been waiting for a long time, so when will I get my thing? Hi there. Is it with Sears kingston? P.S. I LOVE your website and refer to it regularly! Keep up the excellent work and thank you, thank you, thank you! Please let me know if there is a choice of 2 lipsticks with the gift of purchase for April 23 and which colors they are. Hi there! Yes there will be choice of lipsticks and eyeshadows either in plums or nudes. Warning: Free shipping with cosmetics purchase over $29 only applies when you use your Hudsons Bay Mastercard. I ordered Clinique from The Bay online last week. They shipped my regular priced item and then informed me that they are cancelling my bonus as they are out of stock. I just checked the website and they haven’t updated it to say that the bonus is no longer available. Check before you order! will i be able to use a bay gift card when paying at the clinique counter and still get the bonus gift? Yes, I use gift cards all the time there with no problem and get the bonus, too. They are treated the same as cash or a credit card. Do any canadian stores do a bonus for christmas or new year? Drat! The KIT promo code no longer works (Nov. 17/13). Thanks anyway! Appreciate your site! When is the next bonus time in Toronto? September 5, 2013: I am very disappointed Clinique does not keep it’s website up-to-date with the Bonus times at various merchandisers. Hello! do you know of any bonus times coming up in Toronto soon?? Thanks!! i was told by tammy , who works for clinque, that today april 20th, was bonus day at sears???? hi. do you know when the next bonus time in Toronto will be? When is Clinique having a bonus at Sears in Canada? Any ideas on the offers? Probably in April/May… will post about it, definitely. Alice. When will you offer Clinique bonus times in Canada? Thank you. What will the offers be then? Waiting eagerly for a reply. When will the next bonus time be in Canada at Sears or The Bay? Its starts February 6, 2013 at The Bay and goes to February 24, with a minimum purchase of $31. Do you have any other details about the promotion beginning tomorrow?